Angular was a ground-up rewrite of AngularJS and has many unique features. We extend the following services to our Clients. We provide Angular development services to help clients achieve the better user experience. We make use of Angular(Angular 2+ versions are simply called Angular), an open-source front-end web application framework for creating single page application & Progressive web apps with faster and smaller in size, which only requires HTML, CSS and TypeScript on the client side and Node js to run the application. With this technology, we can extend HTML vocabulary and create powerful well-structured, rich applications in a modular fashion. It is widely made use of by developers at places where scalability is a must. We have a dedicated team of developers with knowledge & expertise to develop web / mobile applications over the model–view–controller (MVC) framework. As Angular development is packaged with a built-in end-to-end and unit test runner setup and it is testable from the ground level, it ensures quality development by default. Using Angular CLI we can build app Quickly. Angular have material for Design and lot of Module’s / Libraries to extend the HTML Features. We are capable to do the projects in Angular version’s 2,4,5 & 6. 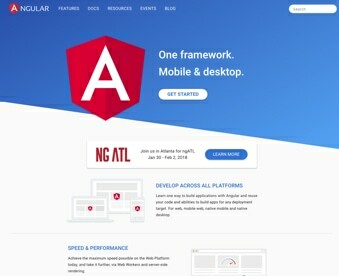 Angular is a flexible framework, a more improved version of Angular 1.X, that allows the development of complex applications which are very easy to maintain and increase their productivity. Provides many benefits over AngularJS 1.x including dramatically better performance(5 times better), more effective templating, lazy loading, simpler APIs, easier debugging and much more. Since Angular is mobile-oriented, we can build complex applications for Web & Mobile too. Use AOT & JIT Compilation method. Custom Component and directive development.